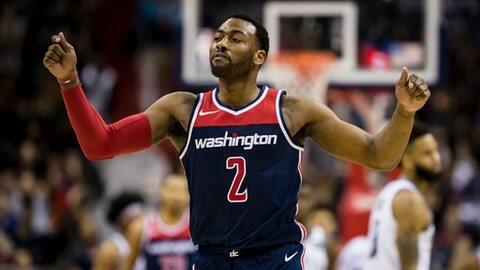 WASHINGTON (AP) After leading the Washington Wizards to their first overtime win of the season, John Wall remained frustrated that the late drama had been self-imposed. Wall scored 17 of his 23 points in the second half and overtime, and tied a season high with 16 assists in the Wizards’ 119-113 victory over the Brooklyn Nets on Saturday night. Yet the perennial All-Star couldn’t shake thoughts of his own performance, which also included eight turnovers, or that of a team that gave back a 23-point lead. Washington has repeatedly struggled to close games at home this season. On Nov. 1, the Wizards lost 112-116 to Phoenix after holding a 22-point lead in the first half. On Nov. 25, they led by 17 in the fourth quarter before losing 108-105 to Portland. They pulled this one out in overtime, when Wall hit two jumpers and contributed three assists while the Nets shot 1 for 8 from the floor. Bradley Beal scored 24 points and Kelly Oubre added 17 off the bench on 5-of-6 shooting. Marcin Gortat had 16 points and 13 rebounds as the Wizards pulled to 2-2 on their five-game homestand and avoided being swept by the Nets in the season series. Beal gave Washington the lead for good on a jumper and followed with a 3-pointer, both off feeds by Wall, to make it 114-109. Then Wall hit a pair of contested jumpers to keep Washington’s lead at five, the latter making it 118-113 with 17 seconds left in the extra period. Nets: Brooklyn fell to 2-7 in the second game of back-to-back sets. … Brooklyn’s starting five scored only 19 first-half points … C Tyler Zeller (left hip) sat out for the first time since Nov. 14. Wizards: Washington swept both ends of a back-to-back set for the first time this season. … Wall received his fourth technical foul of the season during the third quarter. … G Jodie Meeks returned to action after he was left out of Washington’s rotation for the first time this season on Friday night. Beal has now scored 20 or more points in 10 consecutive games, his longest such stretch this season. Brooklyn trailed 59-39 at halftime before closing within three in the third and tying it on a 16-5 run to end the fourth. During that last stretch, Allen Crabbe hit two 3-pointers and fed Caris LeVert for a dunk that closed it to 105-104 with 1:45 remaining. The Nets missed their next three shots and turned it over twice, yet still tied it at 107-all on Quincy Acy’s 3-pointer from the top of the arc with 9.1 seconds left. Nets: Host New York on Monday. Wizards: Wrap a five-game homestand Monday against Milwaukee.